Resilient flooring is visually appealing, low-cost, easy-to-install, easy-to-maintain flooring. Vinyl flooring continues to be one of the least expensive and easiest to install and maintain flooring options available to homeowners. Affordable sheet vinyl which comes in a variety of colors and designs has become a popular choice among homeowners. Resilient flooring no longer means choosing practicality over fashion. Next time you make a flooring choice for your home, think high-style: wood plank, marble, porcelain, limestone, mosaics. Now think low-cost, easy maintenance, and safety. With today’s resilient flooring choices you can have it all. Selecting resilient flooring - materials such as vinyl, linoleum, rubber, and even vinyl tile - no longer requires choosing substance over style. The benefits resilient flooring lie in its name: It takes a daily load of use and abuse - everything from roller and foot traffic to household spills - and requires only minimal maintenance. Sheet vinyl flooring remains among the lowest priced, and easiest to install and maintain of the flooring options. Vinyl's superior slip-resistance and its heat-welded seaming prevents bacterial and viral growth - ideal for kitchens and bathrooms. Fashionable designs such as mosaics, natural stone, wood plank or parquet flooring are visually indistinguishable from the real thing. Linoleum, the precursor to today’s resilient flooring, has been available for more than 100 years. Linoleum is a totally natural flooring product composed of limestone, linseed oil, wood or cork flour, and rosin. Linoleum has the distinctive characteristic of growing tougher over time. The natural oxidation process hardens the material and increases its durability, yet it remains comfortable and quiet underfoot. Linoleum, is also naturally static-resistant and bacteria-resistant. Rubber tile or rubber sheet flooring offers exceptional slip-resistance in high-traffic and high-load areas, and its natural characteristics help reduce vibration and noise. Available in several dimensional profiles for varying degrees of traction, rubber flooring requires minimal maintenance and needs no additional surface finish. Rubber’s high resilience also relieves fatigue when used in healthcare facilities and other facilities where employees routinely spend hours on their feet during the workday. Not one to be lost in the trendy shuffle, rubber flooring is also now available in wider range of colors and, like other resilient flooring, can be easily custom cut and installed in unlimited designs. 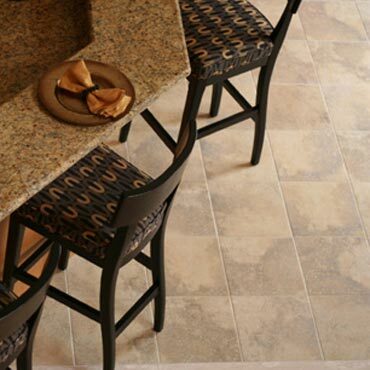 For years, vinyl tile was produced mostly in single, plain colors with little emphasis placed on design or fashion. Today, vinyl tile is available in an array of fresh, saturated colors, enabling homeowners to create custom floor designs while being the least expensive and easiest to install option. The result is vinyl tile can now go into many areas where home owners hadn't previously considered using it because the design possibilities are endless. Of all flooring options, resilient flooring stands out as the easiest to install and the most economical. Resilient flooring is available in a multitude of designs, including looks that simulate natural materials such as wood, stone, and ceramic tile. The wide selection of solid colors and graphic patterns that only resilient flooring can achieve will complement any style of décor. The combination of design options, easy installation and good value makes resilient flooring a great choice for utility areas, kitchens, mudrooms, bathrooms and playrooms.